2018 Elite Extra Edition and 2019 Topps Series 1 are making their debut in this month’s Price Guide. 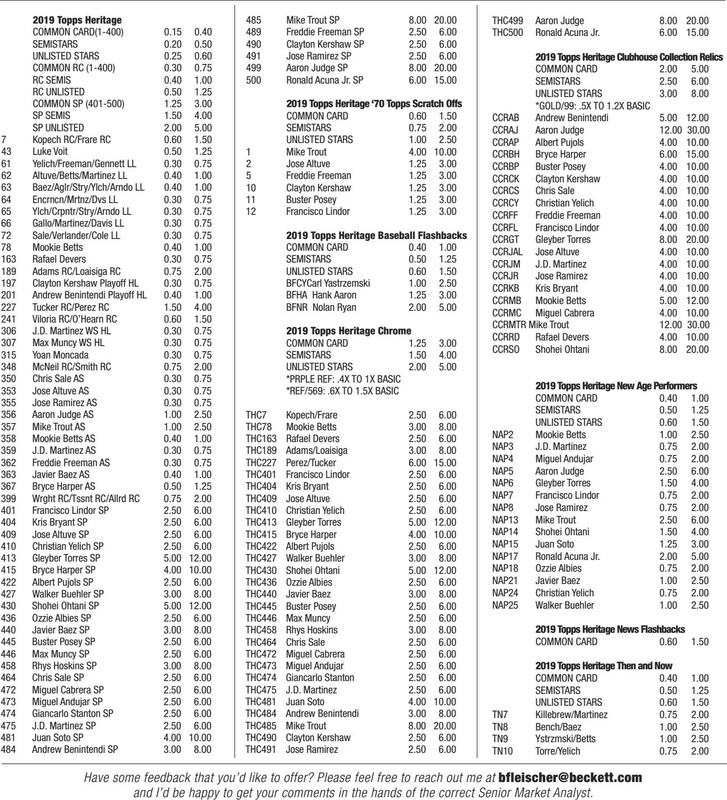 2019 Topps Heritage is partially priced below. Full pricing for Topps Heritage is available now in the Online Price Guide and will appear in the Price Guide of next month’s Beckett Baseball. 2019 Donruss went live shortly before our pricing deadline, not allowing sufficient time to establish secondary market values. 2019 USA Baseball Stars and Stripes, 2019 Topps Inception and 2019 Topps Gypsy Queen are scheduled to go live in the weeks following our deadline. 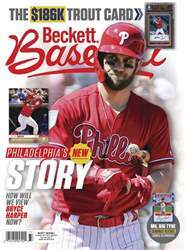 Be sure to check out the Online Price Guide on Beckett.com throughout March and April for pricing on these products - weeks before it will appear in the next issue of Beckett Baseball. What’s Listed Products listed in the Price Guide typically: (1) are produced by licensed major manufacturers, (2) are widely available, (3) have market activity on single cards and (4) focus on players active at the time of issue. What the Columns Mean The LO and HI columns reflect current retail selling ranges. The HI column generally represents full retail selling price. The LO column generally represents the lowest price one could expect to find with extensive shopping. Multipliers Parallel sets and lightly traded insert sets are listed with multipliers to provide values of unlisted cards. Multiplier ranges (i.e. 20X to 40X HI) apply only to the HI column. Example: If base card A lists for 20 to 50 cents, and the multiplier is “20X to 40X HI,” then the parallel version of card A or the insert card in question is valued at $10 to $20. Mint (MT) - No flaws. Four perfect corners, 55/45 or better centering, smooth edges, original color borders and gloss; no print spots, color or focus imperfections. Near Mint-Mint (NRMT-MT) - Must have 60/40 or better centering, smooth edges, original color borders and gloss. One of the following very minor flaws is allowed: a slight touch of wear on one corner, barely noticeable print spots, color or focus imperfections. Near Mint (NM) - Centering of 70/30 to 60/40. In addition, one of the following minor flaws is allowed: a slight touch of wear on two or three corners, slightly rough edges, minor print spots, color or focus imperfections. Excellent-Mint (EXMT) - Centering no worse than 80/20. No more than two of the following flaws are allowed: two or three fuzzy corners, slightly rough edges, very minor border discoloration, minor print spots, color or focus imperfections. Excellent (EX) - Centering no worse than 80/20 with four fuzzy corners. May also have rough edges, minor border discoloration and minor print spots, color or focus imperfections. Very Good (VG) - Handled, but not abused. Slightly rounded corners with slight layering, slight notching on edges, moderate border discoloration, some gloss lost from the surface but no scuffing. May have hairline creases. YOU GOT QUESTIONS? WE’VE GOT ANSWERS.